KaBOOM! and the Fund for Public Housing have partnered to bring new, safe community playspaces for public housing residents across the City. This is the second KaBOOM! playground at a NYCHA development, after last year’s successful Pomonok Houses build in Queens. Around 150 volunteers came out to help build the new playground on Saturday. NEW YORK– In just eight hours, the Bayview Houses community, the New York City Housing Authority (NYCHA), KaBOOM! and the Fund for Public Housing built the latest “NextGen NYCHA Plays” playground this past Saturday. This partnership between NYCHA, KaBOOM! and the Fund for Public Housing, a non-profit that benefits NYC Public Housing residents, will provide much needed community resources for public housing children and the community at large. The Bayview Houses Resident Association (RA) led the initiative to recruit volunteers and support for the development site. Throughout the process, local Bayview children were asked to provide their thoughts and input about what this new playground should look like, including a design day hosted by Bayview RA President Sheryl Boyce where kids drew their dream playground for inspiration. This playground features the Mobius climber, a double slide, and is filled with linked equipment that will allow the kids to play all their favorite tag games. This kid-inspired design offers a welcoming and warm community space that encourages outdoor play time. 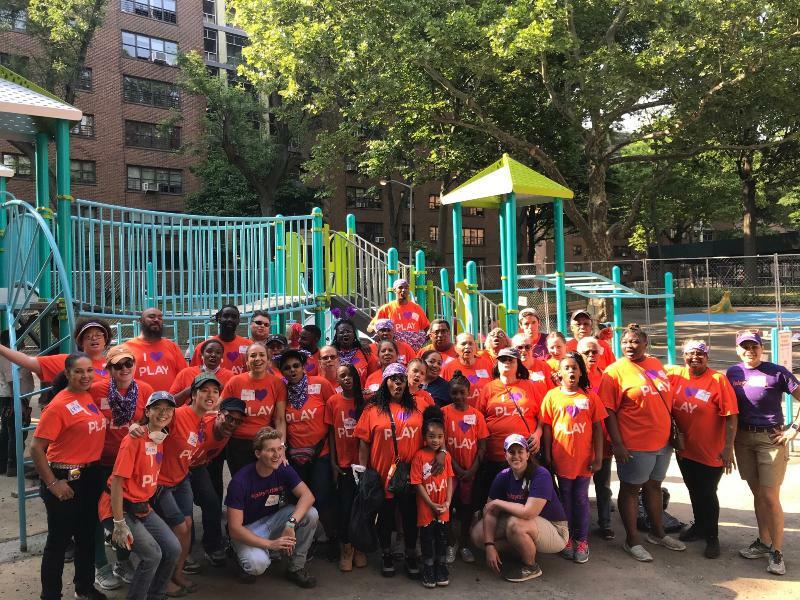 Together, KaBOOM!, NYCHA and the Fund for Public Housing launched NextGen NYCHA Plays, an innovative public-private partnership that will transform communities by building safe, engaging playspaces for kids in NYCHA housing. 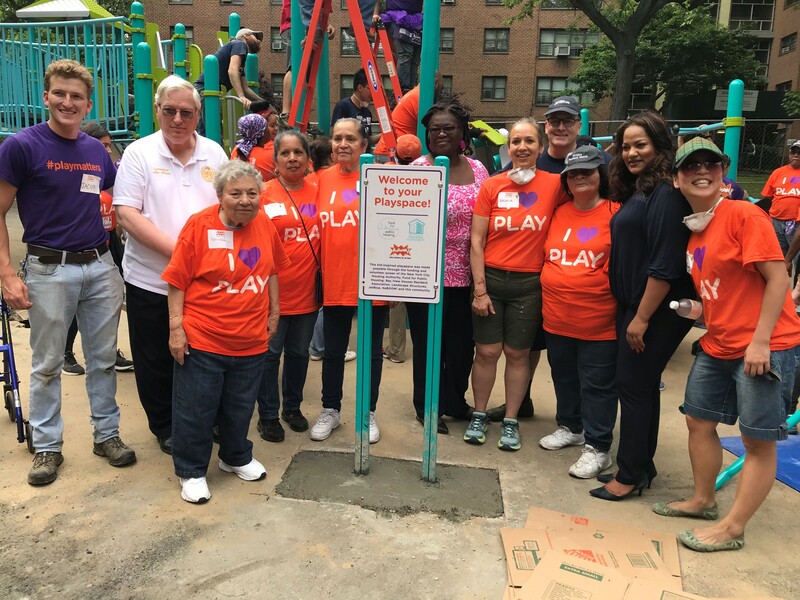 The first playground build was in November 2017 at Pomonok Houses in Queens. Through the NextGen NYCHA Plays partnership more kids will have the joyful childhood they deserve. The new playground at Bayview is made possible by support from JetBlue, Landscape Structures, and a variety of contributors to the Fund for Public Housing. State Senator Roxanne Persaud (5-R), Assembly Member Jaime Williams (2-R) and Council Member Alan Maisel (2-L) joined the volunteers at Bayview Houses. NYCHA’s mission is to increase opportunities for low- and moderate-income New Yorkers by providing safe, affordable housing and facilitating access to social and community services. Almost 400,000 New Yorkers reside in NYCHA’s 325 public housing developments around the five boroughs, and another 235,000 receive subsidized rental assistance in private homes through the NYCHA-administered Section 8 Leased Housing Program. For more information, visit www.nyc.gov/nycha and for regular updates on NYCHA news and services, connect with us via www.facebook.com/NYCHA and www.twitter.com/NYCHA. Never before has there been an organization that exists solely to address the priorities of New York City public housing communities. The Fund for Public Housing is an independent not-for-profit organization that invests in the well-being of New York City Housing Authority (NYCHA) residents and their communities. The Fund collaborates with public and private partners to reimagine and improve the way public housing works. For more information, visit www.fundforpublichousing.org or follow the Fund on Twitter, www.twitter.com/Fund4PH .